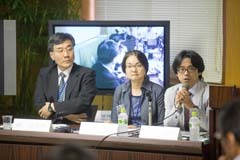 The role of Japan Overseas Cooperation Volunteers in development was the topic as JICA-RI held its fifth JOCV research seminar on May 15, 2015 at the JICA Research Institute in Tokyo. About 70 people attended, including former JOCVs and students. The institute is engaged in a research project to analyze the JOCV program from various disciplinary perspectives, including political science, anthropology, and sociology. The project is called "An Interdisciplinary Study of Japan Overseas Cooperation Volunteers (JOCVs)." The JOCV program has three objectives: development cooperation, mutual understanding between Japan and developing countries, and youth development. Entitled "The Achievements of JOCVs: Leading Actors in Development Cooperation," this seminar spotlighted the aspect of development cooperation. With Professor Yasunobu Okabe of Tohoku University acting as moderator, three researchers considered the role of JOCVs, their achievements and the conditions required for them to achieve results. The presenters and participants pointed out that the JOCVs had made significant achievements in development cooperation. In his address at the beginning of the seminar, JICA-RI Director Ichiro Tambo talked about the JOCV program, which marks its 50th anniversary this year. "Despite the fact that the program is well-known to the public, sufficient research has not been done on it. It is important to analyze from a research perspective how JOCVs are contributing as development cooperation participants." 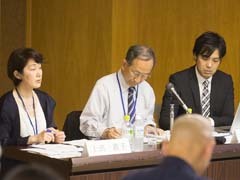 Then Okabe, lead researcher in the project and a visiting fellow at JICA-RI, explained that while the goal of the JOCV program is sometimes understood to be training young Japanese, JOCVs are first of all people who want to engage in cooperation with developing countries, and the objective of the seminar was to directly analyze their role as standard bearers in this respect. To begin, JICA-RI Senior Research Advisor Akio Hosono gave a presentation on "The JOCVs and Capacity Development." Bringing up examples of projects in Central America, Hosono discussed how JOCVs had contributed in three areas: math education, the restoration of indigo dyeing techniques, and the preservation of ruins and promotion of tourism. In the math project, for example, Hosono explained that "exchange between the JOCVs and local teachers had raised the awareness of local teachers and led to capacity development. This achievement would not have been possible without JOCV activities." Next, Naoko Ueda, director of the Southeast Asia and Pacific Department in the JOCV Secretariat at JICA, gave a talk entitled "JOCVs Reach the Heart: Thoughts on an Immunization Program in Bangladesh and Chagas Disease Control in Central America." Ueda brought up the examples of an initiative in Bangladesh in which gatherings and door-to-door visits were carried out to encourage understanding of polio vaccination, and of awareness activities in Honduras to reduce the population of the insect Reduviidae, a carrier of Chagas' disease. She pointed out that by lobbying both the local governments and residents, the JOCVs had succeeded in narrowing the gap between government and residents and in fostering discussions and trust between them. "By getting close to local people," she said, "the JOCVs managed to change not only the relationship between the government and residents but also the sentiment of local people, and to transform social mechanisms and functions." Finally, Yasushi Tokushima, a researcher at the Social Fabrication Laboratory at the Shonan Fujisawa Campus of Keio University, delivered a presentation entitled "Technical Capacity Empowerment in Rural Areas: The Example of the Fab Lab Project in the Philippines." In recent years much attention has focused on the "creative class" of people fabricating new ideas as leaders in the advancement and reform of society. Tokushima served as a JOCV in a rural part of the Philippines until December 2014, launching an unprecedented effort to achieve regional development in cooperation with the creative class. Citing this example, he explained how JOCVs can be active in capacity development. 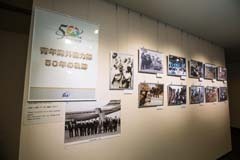 "Through skill improvement and even pioneering efforts involving novel aid approaches," Tokushima said, "JOCVs can contribute to development cooperation." After the presentations, Yukimi Shimoda, a JICA-RI research fellow who participated in the discussion, commented, "The realization of capacity development to comprehensively improve both individuals and society takes a long time. By continuing to work in a community, JOCVs make this possible. At the same time, the foundation for the JOCVs' achievements lies in the fact that they are able to engage in unprecedented and flexible activities." "Our African counterparts often say that things go well when they work with Japanese people. I think the success of the JOCVs has a lot to do with this," said Tambo. In the question-and-answer session at the end, questions were asked about such matters as JICA's support structure for continuing JOCV activities, methods of measuring and comparing a sense of fulfillment and inner motivation, and the ripple effects on Japanese society and neighboring countries in Asia. 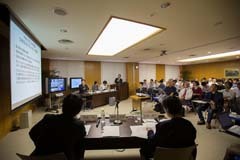 JICA-RI Organizes the First Seminar of JOCV Study: "Review a Half Century of JOCV Program"